The 2018 NFL Draft saw an impressive five rookie quarterbacks come off the board in the first round: Baker Mayfield (Browns), Sam Darnold (Jets), Josh Allen (Bills), Josh Rosen (Cardinals), and Lamar Jackson (Ravens). Perhaps even more impressively, each of these quarterbacks appeared in at least 12 games for their teams this season. So how did this year’s group of rookie quarterbacks match up against previous years in terms of fantasy football production? This article will take a look through every rookie from this decade (since 2010) to see how the 2018 class stacks up. But just because the 2018 class didn’t set records in raw fantasy points doesn’t mean there weren’t bright spots in fantasy. In fact, Allen (17.5) and Mayfield (17.3) ranked sixth and seventh among all quarterbacks since 2010 in fantasy PPG as rookies. Allen had some league-winning weeks thanks to his rushing ability, while Mayfield was remarkable as a passer. Allen’s ceiling is higher so long as he keeps using his legs this way, but Mayfield will be far more consistent, especially because Cleveland has significantly better weapons than Buffalo. Darnold (13.3) ranked 13th of the 30 quarterbacks to play at least eight games since 2010, meaning he was slightly above average. Darnold was an interception machine, but he had occasional bright spots. Jackson (10.3) ranked 27th of 30 quarterbacks in PPG — but that obviously doesn’t tell the whole story (more on him in a bit). From Weeks 11-17, while serving as Baltimore’s full-time starter, Jackson was fantasy No. 5 overall quarterback while scoring 19.7 PPG, which would rank third-best since 2010 behind Newton and Griffin. Rosen, meanwhile, scored just 9.6 PPG — just ahead of Jimmy Clausen (4.7), Cody Kessler (8.8), and Blaine Gabbert (9.0) as the worst rookie quarterback in fantasy this decade. The Cardinals have talent, including David Johnson, Christian Kirk, and, at least for one more year, Larry Fitzgerald, but Rosen’s rookie year was troubling — especially in comparison to his rookie peers. Jackson’s raw fantasy PPG appear low because he appeared in every game even before playing a significant amount of snaps. But as noted above, once he took over as the starter, he was one of the best rookie signal-callers this decade (for fantasy purposes). He was a fantasy-points-per-dropback machine, too. Jackson’s 0.81 PPDB ranked second-best among qualifying quarterbacks (minimum eight games) since 2010. Only Tim Tebow’s 2010 season (1.0 PPDB) was better. Allen (0.53) and Mayfield (0.46) also ranked in the top 10 since 2010 in fantasy points per dropback. For reference, that’s ahead of guys like Jameis Winston (0.46) and Andrew Luck (0.41) — currently two of fantasy’s best quarterbacks. Darnold was a bit behind, at 0.37 PPDB, and Rosen brought up the rear with 0.27. Once again, only Clausen (0.18) and Gabbert (0.26) were worse than Rosen in terms of fantasy PPDB. Newton, Winston, Luck, Russell Wilson, and Dak Prescott all rank in the top 11 in terms of rookie-season fantasy PPDB performances since 2010. If we cheat and include Watson’s rookie year (he played just seven games, and this study had a cutoff at eight), then he obviously makes the list as well. Of the players in the bottom half of the rankings in fantasy PPDB produced during rookie seasons, only Carson Wentz (0.32, 23rd out of 30) has turned into a reliable player. Jackson is the best fantasy option of the bunch. He immediately became a top-five fantasy player as a starter, and he was historically (since 2010, at least) great as a fantasy quarterback as a rookie. 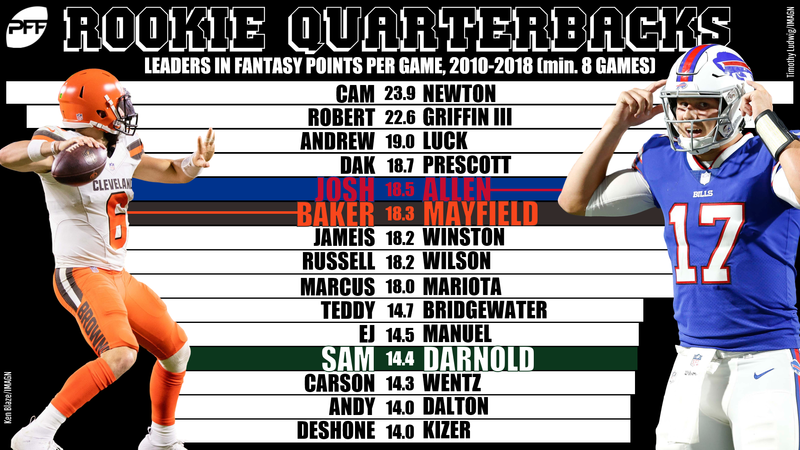 Allen and Mayfield are in the next grouping, with Mayfield having a better chance to leap up to — and challenge — Jackson’s spot as the top fantasy quarterback in this draft class. Darnold is a rung below for fantasy purposes. He wasn’t bad when looking at his 2018 campaign at a historical level, but he was decidedly average. Given that he teetered right in the middle, he really could go either way (turn into a solid fantasy performer or a total pumpkin). It was a bleak rookie campaign for Rosen, and anytime you find your name surrounded by the likes of Clausen, Gabbert, and Brandon Weeden, it’s going to be an uphill battle. We obviously can’t write a player off after their rookie season — heck, Jared Goff is playing in the Super Bowl next weekend, and we all know how bad he was as a rookie — but the deck is stacked against Rosen.